With this post, I want to briefly explain how I moved into the blogosphere and how the title of my weblog developed from "My Blog" to "Fearing God in a Hebel World." In March of 2007, Barry Pendley, a web designer and former student of mine, designed a website for me, Old Testament Studies. Barry also hosts my website, and, as you can see, the website has a great look (if you need assistance with a website and/or search engine optimization, check out Evmikna Graphics). He has placed some material related to the Hebrew courses I teach at Detroit Baptist Theological Seminary, many papers I have written and pictures taken from my teaching excursions outside the United States and other events connected with DBTS. 1 With my initial website, the blog was an afterthought to place some of my occasional Old Testament meanderings for our seminary students; and, as an afterthought, I simply called it "My Blog." Since the inception of this website, "My Blog," had been on the website, as a secondary heading under the primary heading "Resources," found on my home page. However, I did not start using "My Blog" until late August. Initially, I had little interest in blogging; however, while I was teaching a couple of Old Testament classes in East Africa in the summer of 2007, I developed an interest by watching a missionary blogging. When I returned to the US, I began checking out blogs and came to realize that the blogosphere has great potential for ministry. Shortly after this, I planned to start using "My Blog," which had been lying dormant for six months, with the beginning of DBTS’s fall semester. So in late August of 2007, I set up my first post with my Hebrew Syntax and Reading class serving as my guinea pigs, "Hebrew Syntax & Reading First Day." Why then did I change the name "My Blog" to "Fearing God in a Hebel World"? The change was for two reasons. First, "My Blog" was initially an afterthought and was a banal title. I wanted to change the name so that it was coordinate with some of my exegetical work at DBTS. Second, and more specifically, I have chosen a name that is derived from my study of Ecclesiastes. The word hebel is taken from Ecclesiastes 1:2 ESV, or, which may be rendered with some transliteration as, “Hebel of hebels, all is hebel.” This word is often translated as "vanity"; however, I have taken it as “puzzling” or “enigmatic.” Solomon describes all of life on earth as “puzzling.” However, "puzzling" does not pick up the sense of frustration that Solomon experienced when he attempted to live independently of the living God. In the first issue of the Detroit Baptist Seminary Journal, I wrote an article in 1996 entitled "The Message of Ecclesiastes." In this article, I supported taking hebel as "frustratingly enigmatic." This was the type of world that Solomon lived; and it is also the type of world in which we live. This is what life is like in a sin-cursed world. The change in the name of my weblog focuses on the area of biblical study where I have my greatest interest, Ecclesiastes, though I will continue to provides posts on Psalms (and, other areas where I have interest, especially recent creationism) as I warm up for the summer school class that I plan to teach in the summer of 2008, "Understanding the Psalms." Because I want to connect my weblog to Ecclesiastes, I linked Solomon’s final exhortation, “fear God” (Eccl 12:13) with the subject of Ecclesiastes, “the frustratingly enigmatic nature of life on earth” (Eccl 1:2). At this point, it is easier to transliterate hebel than to translate it. Thus, the title “Fearing God in a Hebel World.” Now my title focuses on only one response to life in hebel world: fear God. However, there is another recurring response in Ecclesiastes that we should not exclude with this explanatory post: the celebration-of-life motif. I have attempted to catch this nuance with the picture I have used with this post. 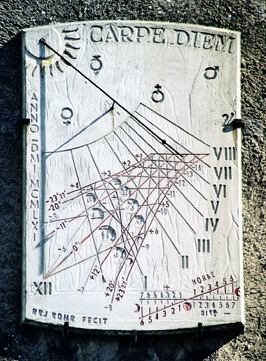 Notice the picture’s title, "Carpe Diem" ("Seize the Day") is connected to a sundial that reflects living "under the sun." In essence, the enjoyment-of-life motif is a challenge to judiciously use the gifts that God has given us while we exist on earth and to seize the momentary use of these gifts in a God fearing manner. In light of this, I could have called my weblog: "Life in a sin-cursed world can properly be enjoyed when one has a vital relationship with the sovereign God who holds mankind accountable." However, this title is too complex; how could I squeeze this title onto a header. At the end of the day, the title that most captures the message of Ecclesiastes is "Fearing God in a Hebel World." This was the quest of Solomon’s life and it is also my quest, though I am greatly hindered because I am not a king and am lacking one or two of his shekels. In the near future, some form of this title will be one of the main subjects on my home page: Old Testament Studies. Keep your eyes posted for this change. How did you like the picture? It fits my understanding of Ecclesiastes. Related to Ecclesiastes, I listened to a great introductory sermon to Ecclesiastes by Pastor Jon Trainer, “The Wisdom of Solomon” at http://www.getnewhope.com/files/sermons/sermon_20071014.mp3. If you get a chance, it is a good sermon to listen to. Your observation is interesting, Will, because Barry and I talked about this very thing this past week end when we were at the Creation Museum in Kentucky. At this point, I have decided not to go that route; however, I need to initially make certain that this blogging thing is a good fit for me. I am glad to have this link to your blog. I hope to come here often. Thanks for all your work and for sharing it with others. I am glad to hear from you and thanks for stopping by my blog. I was glad when we changed the no-beard policy for I had a beard in my early 30’s (for a picture from my youth, click here and scroll down below the first paragraph) but had to shave it when I returned to seminary at Grace. You probably do not have the same problem that I do: a completely gray beard. Please feel free to stop by my website and blog to make use of it. I trust that God will enable you to faithfully serve him.